David, 79, has been volunteering as a schools reading volunteer since 2000. ‘My name is David, I will be 80 in a month’s time and I can tell you that volunteering has changed my life! Although I’m currently not able to volunteer as I have some problems with my walking, I have volunteered as a school reader with Learn Together Cymru since 2000. My role was as a volunteer reader, in both the English and Welsh language. In that time I spent every Wednesday morning reading with pupils, at one stage dividing my volunteer time between 5 different schools over 4 days a week. As well as being a reading volunteer, I was also called upon every September to give a talk to year 6 about the Second World War… and how I won it! I was born just before the war, so as a schoolboy growing up I was able to recall certain features of the war. Whenever I did these talks at school, the children wanted to know about food rationing. I would tell them about how my mother would say to my brother and I, ‘You can’t have any sweets now until Christmas!’ My mother would save the coupons that were given out for sweets and would save them up for a big splash out at Christmas, which was very special. The children like hearing about how we did find alternatives to sweets however… we would go into the pharmacy and buy cough mixture sweets and eat those! Not the real thing, but close enough. I explained that there was no fear because the head teacher was with us, thinking he was asking about the bombs. But it turns out I got the angle wrong because he asked, ‘Were you afraid? Of the dinosaurs?’ He really thought I was that old! The teachers would often be very embarrassed, but for me the children have got over the hurdle of being afraid or apprehensive, so they are more likely to learn. I was never a teacher, but I find when I cast my memory back to the days when I was in school (what a memory!) 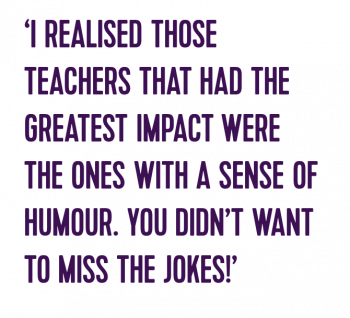 I realised those teachers that had the greatest impact were the ones with a sense of humour. You didn’t want to miss the jokes! I always liked it when children were prepared to tell me what they thought. Over the course of 17 years there were many comments that caused teachers embarrassment, but I often find them hysterical. Looking back on it, it’s been a wonderful time in my life. My wife passed away and we were a very close couple, so there was a big hole in my life. I needed to do something. For some years I went and studied at university, but it was never quite what I was looking for. I needed to be back with people. My volunteering with Learn Together Cymru was instrumental in encouraging me to take part in future volunteering. I used to travel quite a bit on my own, and once I met a lady and her husband who got me involved in volunteering as a teacher in Ghana, where I helped children to read as a reading volunteer. It was only when I started that they heard of Wales!